The draw was Wolves' third 0-0 in four games! Yes it was another dull 0-0 draw but what a great day Fulham away turned out to be in the glorious sunshine that covered London. I was a bit sceptical going to Craven Cottage for the first time. Previous trips to the capital this season had left me leaving with mixed feelings. A 4-0 thumping at Chelsea, a fantastic win at Spurs and a heartbreaking defeat at the Emirates. All this added to the strange fact that Fulham’s away end had no segregation (it just goes to show it can be done at some clubs and I saw no trouble). 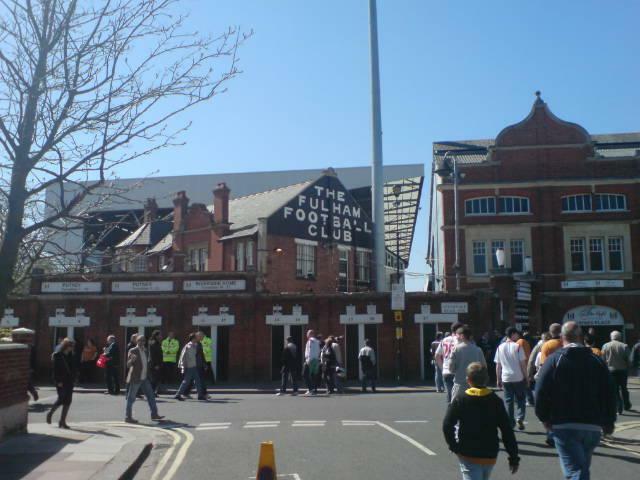 It was a beautiful day in West London and I loved the traditional yet modern feel to Fulham’s stadium. It’s obvious from the fact that Craven Cottage is packed into a crowded area of houses that probably cost around £500,000 each that they have no hope of expanding the ground. Instead, Mohammed Al Fayed (who paraded himself pre-match much to the displeasure of the travelling support) has made the best of what he has at his disposal. Wolves’ fans packed out their side of the Putney end and there were numerous pockets of gold and black throughout the rest of the stand. Everyone was in such a joyous mood. Fulham fans were dormant throughout but Wolves fans were happy to have their own party. Maybe it was the bottles of wine you could buy from down in the concourse. Maybe it was the bags of roasted vegetables, or maybe the lamb, mint and rosemary pies? I stuck to a rollover hotdog anyway! The early arrival of the official club coaches again meant that Wolves fans had time on their hands so many headed into the ground upon the opening of the turnstiles. Large plasma screens aided Wolves fans to watch the equally boring Manchester derby before heading up into the ‘temporary stand’. I say temporary because it didn’t feel particularly sturdy when everyone was bouncing to the ‘SEB is Wanderers’ #9’ chant. Due to the ground’s location parallel to the Thames, you could even walk to one end of the concourse to buy a gourmet pie and enjoy the views across the river once inside. I’m not sure if my experience would have been the same if it had been a cold Tuesday night in December but yesterday was perfect. All apart from the fact every train leaving Wolverhampton station once back in the Black Country last night was severely delayed meaning my Chinese takeaway was getting cold back in Shelton! I started out from the Potteries at 8am and finally arrived back at 10pm. All part of the away day experience I guess. Next and final stop this season – Portsmouth. 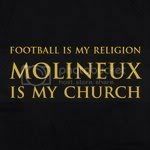 Here’s to a staying-up party at Molineux next Saturday. Up the Wolves!! *A special mention to the members of Punjabi Wolves who played their own version of ‘we shall not be moved’ during the walk back to the coaches after the game. What has been your favourite away day this season? Leave your comments below. I didn’t think there would be any highlights but Match of the Day put something together so here it is.